It's almost Valentine's Day, so to help you get in the true spirit of the holiday, Kidzworld takes a look at some classic cartoon couples. In 1960 the Flintstones and the Rubbles changed TV forever when they became the first primetime cartoon for adults and the first series ever televised in color on ABC! These two classic couples met when Barney and Fred worked at a resort during the summer, soon they were all married and had little Pebbles and Bamm-Bamm running around. Even though Fred and Barney were always caught up in some crazy scheme, their devoted wives were behind them 100 percent and willing to help clean up the mess. 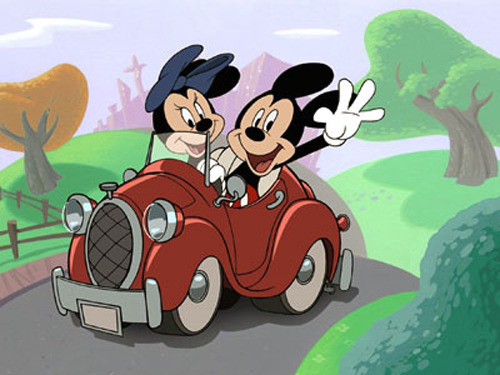 Two iconic Disney characters, Mickey and Minnie first appeared together in the film Plane Crazy on May 15, 1928. Mickey invited Minnie on a plane ride and when Mickey tried to kiss her, she parachuted out of there. From then on Mickey was hooked, constantly trying to make her his girlfriend, while Minnie played hard to get. No matter what story this classic couple starred in, it was obvious that Mickey and Minnie were made for each other. Peter and Lois first met at the country club Lois' wealthy family belonged to. Peter was just a towel boy, but he impressed her by being silly and easygoing, unlike the stuffy guys Lois was used to. As far as cartoon couples are concerned, opposites obviously attract and Family Guy follows the pattern. No matter what silly stunt Peter pulls, Lois always stands by her dumb, accident-prone husband (even though he doesn't deserve it most of the time). Everyone's favorite futuristic cartoon family, The Jetsons, first aired in 1962, following the success of The Flintstones. George and Jane, along with kids Elroy, Judy and pet Astro live in the year 2062 where flying cars zoom around, houses stand on adjustable columns in the sky and robotic maids help with the housework. George only works at Spacely Sprockets three days a week - even though he gets fired by Mr. Spacely almost every episode - and technology helps Jane out with her role as homemaker. That means this classic couple can spend a lot of quality time together, which is an important part of a happy marriage, even in the future. Springfield's most famous family have been going strong for almost 20 years. Homer and Marge met and fell in love at Springfield Highschool in 1974 and when Marge got pregnant with Bart, they got married in a small wedding chapel just outside the state line. Homer got a job at the nuclear power plant, they bought a house, and pretty soon Lisa and Maggie were born too. As many times as Homer has messed up, Marge has been for him with unconditional love. And even though he has a lot of faults, Homer is fiercely loyal to his family. In a strangely romantic move, he even arranged a surprise second wedding to Marge complete with a famous band to make up for the lousy first one. Now that's love. Who's your favorite cartoon family of all time?